Bertrand Dumazy is a graduate of ESCP Europe and has an MBA from Harvard Business School. He started his career as a consultant with Bain & Company. He was then Investment Director for BC Partners, before founding the company Constructeo, a digital and collaborative transactional platform in the construction industry. In 2002, he joined the Neopost group, where he was head of Marketing & Strategy before becoming Chairman and CEO of Neopost France in 2005 and Chief Financial Officer of the group in 2008. In 2011, he was appointed Chairman and CEO of the Deutsch group, which he managed until it was acquired by TE Connectivity. 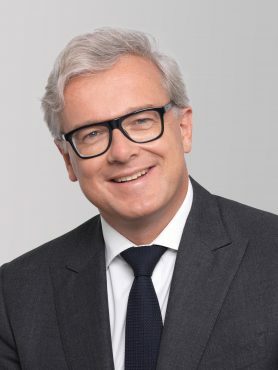 In 2012, he joined the Materis group, in which Wendel is the majority shareholder, as Senior Vice President and CEO of Cromology (formerly Materis Paints), a global player in the decorative paint sector, before becoming the Chairman and CEO in 2015. Since October 2015, he is Chairman and Chief Executive Officer of the Edenred Group and Chairman of the Supervisory Board of the UTA Group.